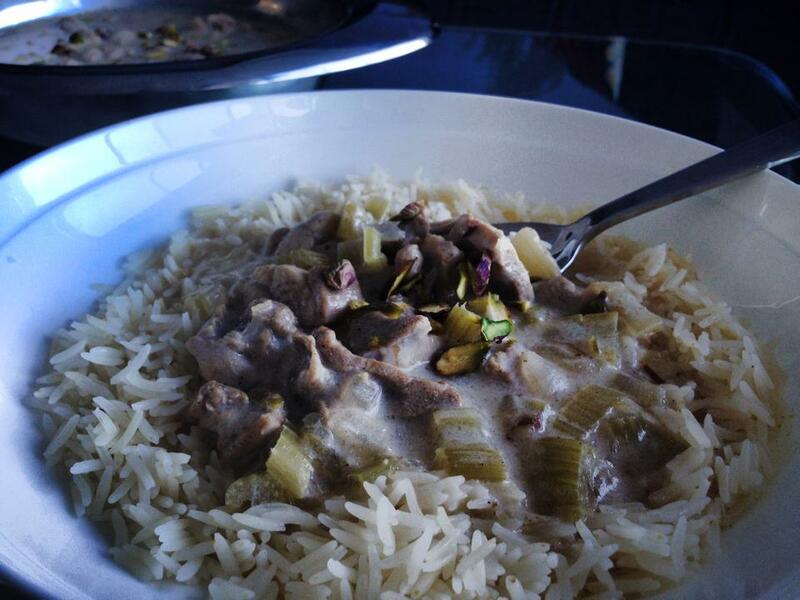 I adapted this recipe from Greg Malouf’s cook book, Saraban, recipes inspired from his travels around Persia. It was the first time that I ever had chicken cooked in yoghurt and loved it. It is simple and easy to make. The original recipe uses orange juice which I liked but I preferred using lemon instead. I also made a few minor changes such as using fresh ginger instead of ground. I also use water instead of chicken stock. I didn’t want the dish to have a strong chicken flavour, and I am not a big fan of ready made chicken stock. Who has the time to make their own! I am adding the original recipe ingredients for you in square brackets  if you wish to try it.You can also substitute some if not all of those ingredients in square brackets  for mine. If you are using Greg’s original recipe and using the orange juice. Do use the raisins as it goes really well with it. If I am in a hurry and do not have time to follow instructions below for saffron liquid, I just soak the threads and in the hot water as per quantity below and let it stand for 30 minutes while I prepare the dish and then add it. Ps: The extra teaspoon of cornflour is my addition as I did not feel the dish was thick enough. I also do not like to add 1 egg to prepare yoghurt for cooking as per original recipe. I do not feel it is necessary. Lightly toast the saffron threads in a dry frying pan over a medium heat for about 30 seconds. while teh threads must be totally dry, be very careful not to burn them. As they crisp up, they will begin to release a wonderfully pungent aroma. Tip the saffron into a mortar and leave for a minute or two before grinding to a powder. Mix the ground saffron with the boiling water and set aside to infuse for at least 1 hour before using.The colour will continue to develop for about 12 hours. Heat the oil in a large pot, add the onion and celery and fry gently until soft and translucent. Stir in the spices and fry for another couple of minutes. 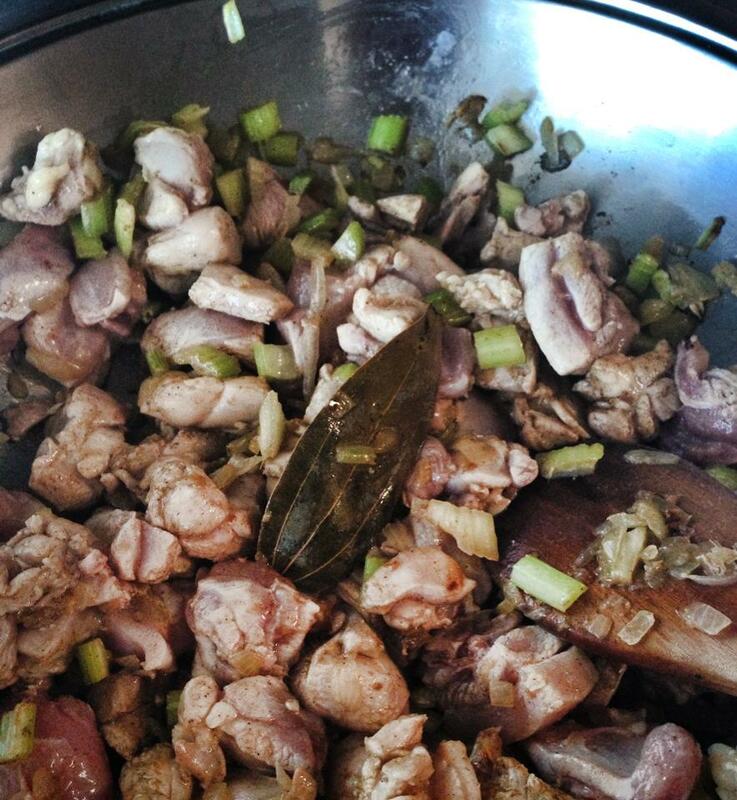 Add the chicken pieces stirring to coat with the spices and cook stirring for about 5 minutes. Add the bay leaf, saffron liquid, citrus juices and zest and bring to boil. Add the salt then lower the heat and let it simmer for about 45 minutes. 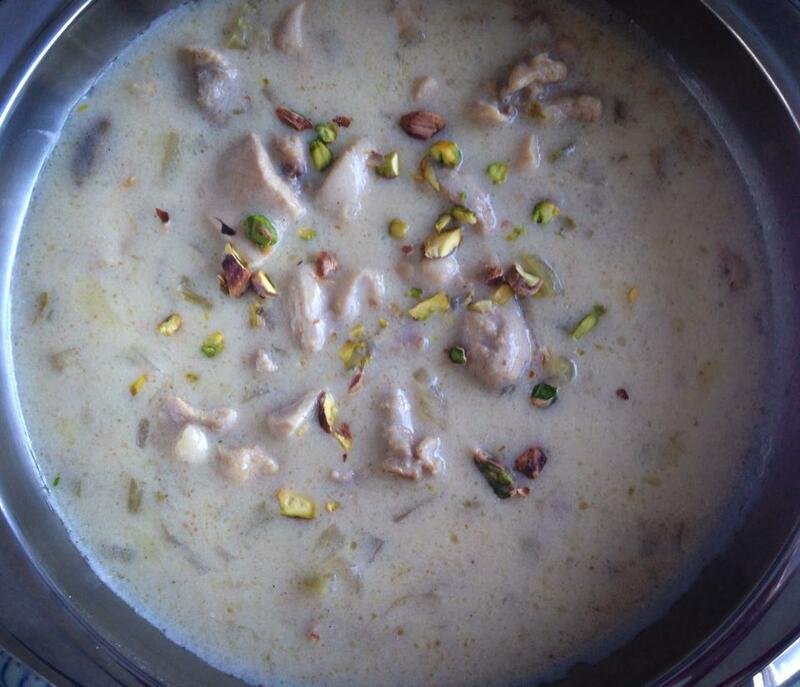 While the chicken is cooking prepare the yoghurt by whisking it in a bowl until very smooth. Mix 1 teaspoon corn flour with the 1 tablespoon of water and add it to the yoghurt. Stir well to combine then add to the pot and keep on stirring continuously. Cook at a bare simmer for another 5 minutes. Add pistachios and raisins if using them. Adjust salt to your taste prior to serving. 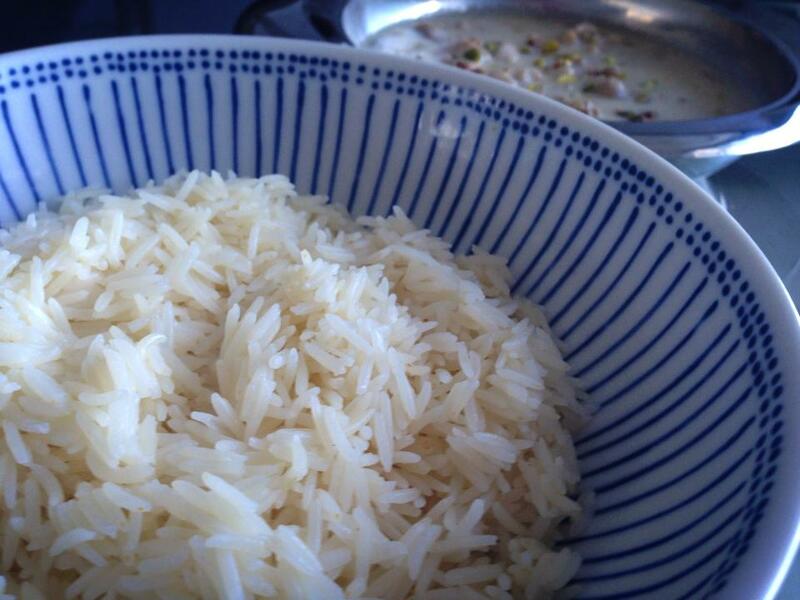 Serve with buttery plain basmati rice. Recipe below. Clean rice and drain. Place the butter in the pot and bring to boil, then add rice and stir for two minutes coating with the butter. Add water and sea salt. Bring to boil and then simmer for about ten minutes or until cooked. Check that the rice is cooked by crushing a single grain between two fingers and making sure it is soft. Turn the heat off and place a dry tea towel on top of pot then put lid on top and fold excess material on top of lid. This will absorb any additional steam. Tags: books, chicken, cleaneating, culture, food, glutenfree, healthy, inspiration, persian, recipes, yoghurt. Bookmark the permalink.